I wanted to share this cool art blog called Chirtopolis. 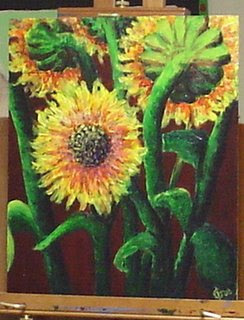 This great sunflower painting posted there was done by an Edmonton artist and teacher. As well she has posted pieces of art produced by elementary school students. I have been travelling south and east for two weeks in a thirty-year-old motor home with my partner and my teenage son. We have been fishing, hiking, and mountain biking, far from civilization and out of range of cell phones and the Internet. After several days, we head into a town or city, visit, shop, eat, and connect, then retreat again to the bush. Right now, we are visiting friends at their rural lakeside home for a few days. We have enjoyed good food, red wine, and conversation. One of the friends is about to leave on a week-long canoe trip, so my partner has spent much of the day helping him prepare his boat for the trip. We have joked about role reversal, as the two men sit sewing a sail, and the two women lounge in lawn chairs, reading and drinking beer. Tomorrow, we will depart, and head for the mountains. Then, we'll attend a music festival, then travel to a city where I have to attend a meeting, and then we'll drive back home. I am glad to spend three weeks this August travelling, as soon it will be September, and my work will be very busy, and there will be little time for contemplation. Holidays -- It would be nice if more of our time was holiday time and less was work time. But, I guess that is called "retirement."